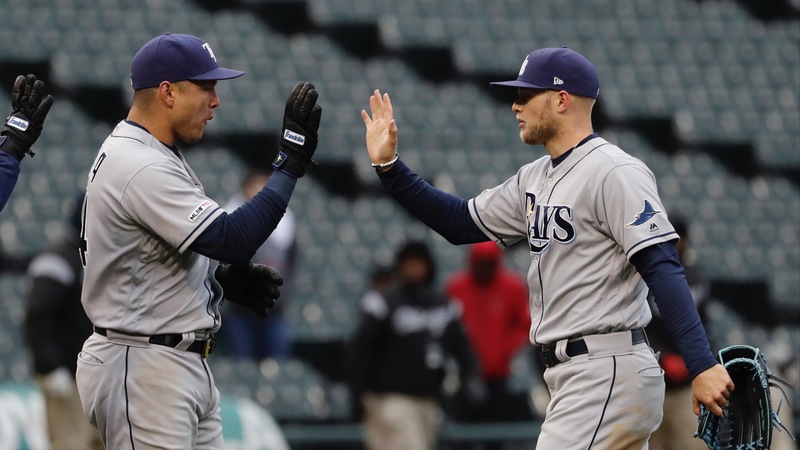 The Rays are 10-3 following Wednesday's win over the White Sox, but bettors may have missed their chance (at least for now) at getting a good price on their World Series futures. The Rays are 10-3 following [Wednesday's win over the White Sox](https://www.betchicago.com/ap-bba-rays-white-sox-), but bettors may have missed their chance (at least for now) at getting a good price on their World Series futures. Here are four reasons why you should hold off on Tampa Bay bets to win the World Series. __MORE:__ [Fantasy baseball waiver wire add/drop](https://www.betchicago.com/fantasy-baseball-waiver-wire-add-drop-mlb-april-8) | [Oddsmakers react to Mariners' hot start](https://www.betchicago.com/mlb-action-report-mariners-rays-moncada-torres) ## Rays World Series odds already shortened Tampa Bay [was 25/1 to win the title](https://www.betchicago.com/mlb-action-report-mariners-rays-moncada-torres) Monday at the Westgate SuperBook, but was down to 20/1 as of Wednesday evening. It was 22/1 at [offshore book](https://www.betonline.ag/sportsbook/futures-and-props/mlb-futures) BetOnline. Twelve teams had shorter odds, but only Seattle had a better record, suggesting books still don't see the Rays as a legitimate threat. "They are definitely a public team," said oddsmaker Robert Walker of US Bookmaking via text. "Pitching has been off the charts ... it's early though." An opening series where they took three of four from the Astros turned bettors onto them, and they haven't been an underdog since, despite playing their last six games on the road (three in San Francisco, three in Chicago). ## Red Sox, Yankees are still in the AL East Tampa Bay, off to its best start since 2010, had [the largest division lead in baseball](https://www.thescore.com/mlb/standings/american-league) following its win on Wednesday, which is surprising since the AL East is home to [the preseason World Series favorites](https://www.betchicago.com/world-series-odds-2019-white-sox-long-term-outlook) and the defending champs. But the Yankees (5-6 going into Wednesday night's game against the Astros) have been beset by injuries -- Luis Severino, Didi Gregorius, Dellin Betances and Giancarlo Stanton to name a few -- and the Red Sox have started 3-9, with seven-time All-Star Chris Sale owning a 9.00 ERA through three starts. A hot streak for either Boston or New York will likely legthen the Rays' odds, so you might as well wait for that to come -- and it should unless it turns into a catastrophic season for both teams. For as hot as the Rays have been, they've yet to play a division game. That'll come Friday, when the Rays start a stretch of nine in a row and 12 of 15 against AL East opponents. Tampa Bay went 90-72 last season (.556), but was only 17-21 (.447) against Boston and New York and finished seven games behind the A's for the second wild-card spot. ## Playoff odds Despite their great start, Fangraphs gives the Rays only [a 59 percent chance](https://www.fangraphs.com/standings/playoff-odds) to make the playoffs (fifth-best in the American League) and 3 percent to win the World Series (also fifth-best in the AL), while FiveThirtyEight gives them [a 66 percent chance](https://projects.fivethirtyeight.com/2019-mlb-predictions/?ex_cid=rrpromo) for the playoffs and 6 percent to win the Series. Neither site has them as the AL East favorite, and only one team -- the 2014 Giants -- went from the one-game wild-card playoff to winning the World Series since it was instituted in 2012. ## Rays lineup lacking in power While the pitching staff has [an MLB-best 2.06 ERA](http://www.espn.com/mlb/stats/team/_/stat/pitching) as of Wednesday night, Rays hitters had only 11 home runs in 12 games and a .697 OPS (19th in baseball) going into Wednesday's win over the White Sox. They also had [the fourth highest](https://www.teamrankings.com/mlb/stat/batting-average-on-balls-in-play) batting average of balls in play (BABIP) at .323, per TeamRankings.com, suggesting the Tampa offense might be getting a bit lucky. Austin Meadows had four of the Rays' 12 home runs, and he's never finished with more than 12 in a season as a professional -- that was in 2016 on two levels of minor-league ball. Tampa finished with the fourth-fewest home runs in baseball last season (150) and still got to 90 wins -- which is good, but likely won't be enough to make the playoffs this season, either. They've won five games already when scoring four runs or less, a run that's not likely sustainable over the course of 162 games. __PLAY:__ Our [free contests](https://betchicago.chalkline.com) for the chance to win a BetChicago prize pack.